Corrected Transcript and Commentary Copyright © 1996 by Eric M. Jones. Scan and panorama assembly credits in the Image Library. Except where noted, audio clips by David Shaffer. Last revised 22 August 2014. 121:44:35 Scott: Okay, Jim, here we go. 121:44:37 Irwin: Okay, Dave. We want a heading of 203. 121:44:45 Irwin: (To get to) Checkpoint 1. 121:44:49 Scott: Going to miss that double Ackerman (front and rear steering), I can see that now. 121:44:55 Irwin: Okay, we're moving forward, Joe. 121:45:02 Scott: Whew! Hang on. 121:45:16 Irwin: Heading directly south right now to miss some craters off to our right - very subdued craters. 121:45:28 Scott: Hang on. Get a feel for this thing. Nine kilometers an hour, Joe. (To Jim) Hold the geology; let's get the Rover squared away first. (Pause) Okay; 8 kilometers (per hour) up a little rise. Okay, turning back. (Pause) 203, huh? Okay. 121:45:57 Irwin: (Heading) 203 for 2 miles (means kilometers). 121:46:05 Scott: Okay. (Noticing a sharp rimmed crater) That's a nice, young, fresh one. 121:46:10 Allen: Dave and Jim, Houston. 121:46:11 Irwin: Speed's varying between 8 and 10. 121:46:15 Scott: Go ahead, Houston. 121:46:16 Allen: Roger. 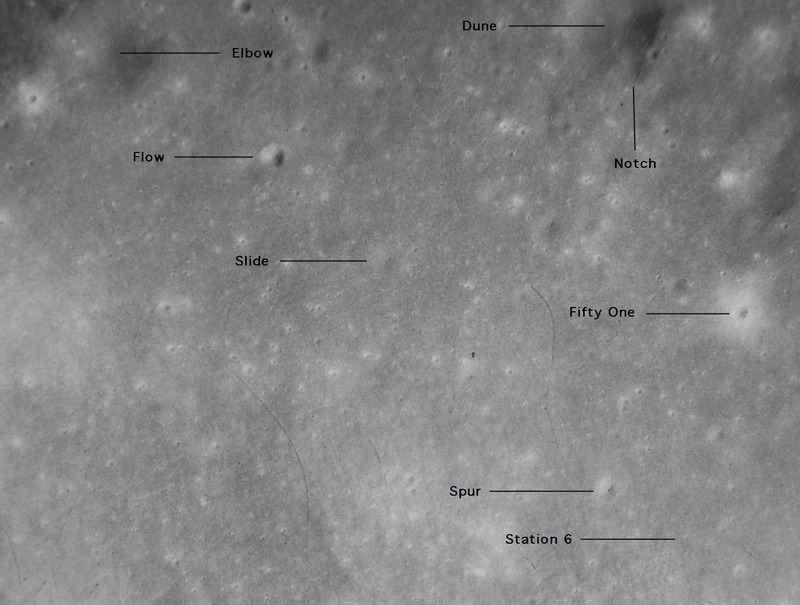 Our TV pan suggests, you can go straight for St. George Crater, and you'll find Elbow okay. And we're suggesting you omit Checkpoint 1. 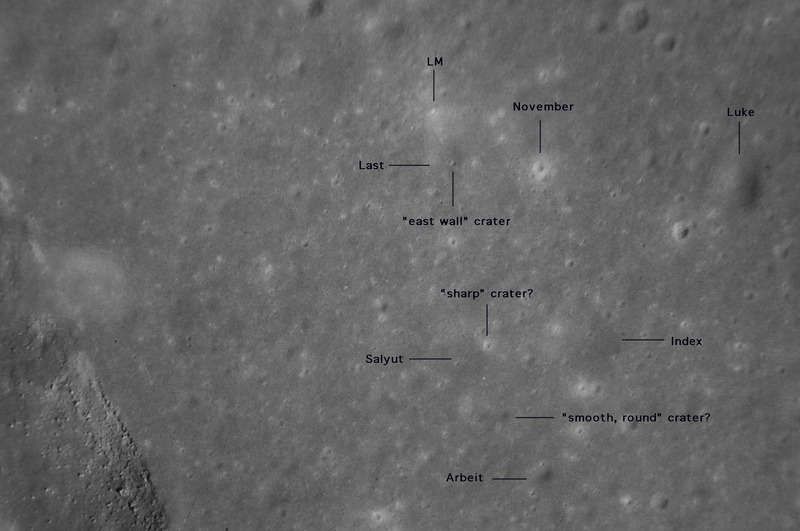 Rhysling Crater should be a good landmark along the way, and head 208. Over. 121:46:36 Scott: Okay. 208, Joe. 121:46:39 Irwin: Okay, we're doing 10 kilometers, now. Now we're heading uphill; when we head uphill, it drops down to about 8. 121:46:47 Scott: No dust, Joe, no dust at all. 121:46:54 Allen: And, Jimmy, we're standing by for amp readouts. 121:46:57 Irwin: About 9 kilometers, now. 121:47:01 Irwin: Okay, amp readout is...Looks like 15 on 1. I can't quite see 2. 121:47:18 Scott: Okay, I guess...Could this be Rhysling right here, Jim? 121:47:21 Irwin: Probably is...This large depression off to our left? 121:47:48 Scott: Boy, look at that; we're going to have to do some fancy maneuvering here. 121:47:55 Irwin: There's an elongate depression here (at about 73.2 and stretching from BL.8 to BM.6) before you get to Rhysling. I don't think we're to Rhysling yet...Rhysling ought to be about 1.4. We've only gone, (let's) see, 0.4 (kilometers). 121:48:08 Allen: ...we think you're short of Rhysling now. 121:48:13 Irwin: Do you think that's probably Rhysling out about 11:00 o'clock to us, Dave? 121:48:18 Irwin: Out about, maybe, 1 kilometer. 121:48:21 Scott: Yeah. Okay, Joe, the Rover handles quite well. We're moving at, I guess, an average of about 8 kilometers an hour. It's got very low damping compared to the one-g Rover, but the stability is about the same. It negotiates small craters quite well, although there's a lot of roll. It feels like we need the seat belts, doesn't it, Jim? 121:49:24 Allen: Just like in the owner's manual, Dave. 121:49:26 Scott: Okay, we're heading right...(Stopping to listen to Joe) Yeah, man! Okay, I've got it on the wall here (that is, at full throttle) for a minute, and we're up to 12 (km/hr). 121:49:41 Irwin: As soon we head upslope, it drops off. 121:49:44 Irwin: Or, are you deliberately slowing down? 121:49:46 Scott: Yeah, I slowed down in order to get my feeling before we start sprinting. 121:49:51 Scott: Look at this little fresh one. Boy, look at that! Lots of very angular frags all over the thing. 121:49:58 Irwin: Yeah, we passed several of those. 121:50:02 Scott: Okay; I'm going to cut down to the south here, Jim. 121:50:05 Irwin: Yeah, that'd probably be best, because I think that's probably...Let's see, range (is) point 7. That's still not Rhysling. Shouldn't be. 121:50:14 Scott: Whoa! Hang on. 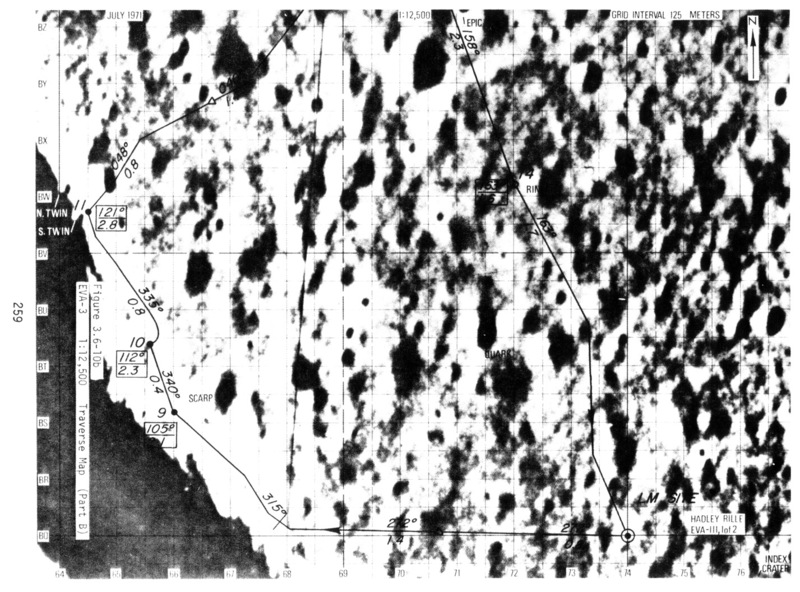 121:50:21 Irwin: And we have a large subdued one at our 1 o'clock position, I'd estimate 50 kilometers (means "meters") wide. 121:50:36 Irwin: [Range is] 0.8. 121:50:54 Scott: Pick a spot here, okay. (Pause) You really have to pick your way. 121:51:02 Irwin: Yeah. You're only about half way to Checkpoint 1. We shouldn't...What I thought was Rhysling was probably not Rhysling. Rhysling is a larger crater, and it's out at about 1-point...should be about 1.4 from the LM. 121:51:32 Allen: That's affirm, Jim. Right on. 121:51:34 Scott: Okay. (Pause) Whoa. Hang on. 121:51:43 Scott: Yeah, man. (Pause) You back off on the power, it keeps right on going. 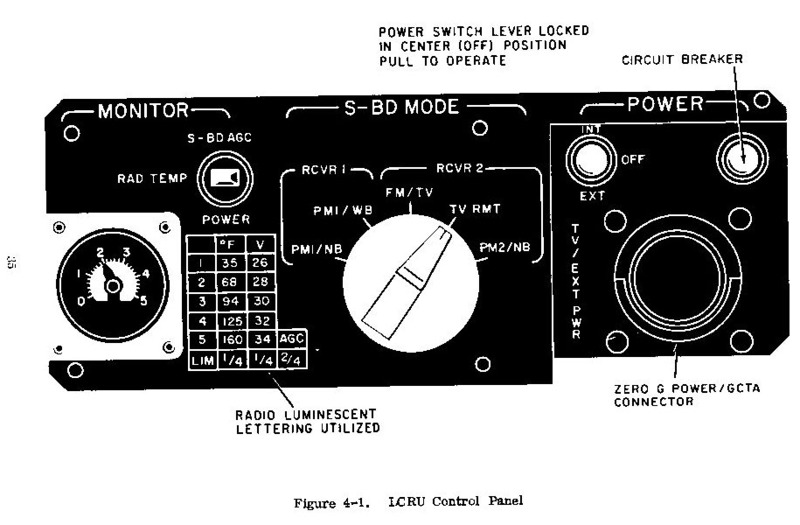 (Pause) The zero-phase lighting is pretty tough, Joe. 121:52:02 Scott: We're going to have to make sure we keep at an angle (to downSun). Once I look into zero-phase, it all looks flat. (Pause) There's a nice little round one-meter crater with very angular frags all over the bottom and the rims, and glass in the very center. About a meter across. 121:52:27 Allen: Roger, Dave. And, Jim, as you come up on the rille, you may want to turn your 16-millimeter camera on. 121:52:37 Irwin: Yeah, when we get to the rille, we will, Joe. Can't see the rille at all from here. Still looking for Rhysling. 121:52:54 Scott: Okay, right now our bearing is 039 for 1.1. 121:53:04 Scott: Okay. (Laughs) Click. (Long Pause) Hey, Jim, give me...Well, I just have to drive around these craters; that's all there is to it. 121:53:28 Irwin: Yeah. We have a large subdued one on our right about 60 meters wide with several small ones in the center. By small, I mean about 10 meters in diameter. 121:53:50 Irwin: Boy, it really bounces, doesn't it? 121:53:54 Scott: Well, I think there's sort of a...The rear end breaks out at about 10 to 12 clicks. 121:54:04 Allen: Roger, Dave. It sounds like it's like steering a boat, with the rear steering and the rolling motion. 121:54:15 Irwin: Yeah, I was looking at that one at 1 o'clock to us right now. Very fresh angular blocks of lighter albedo material on the south rim. 121:54:25 Irwin: We kick up a little dust when we go through these craters. 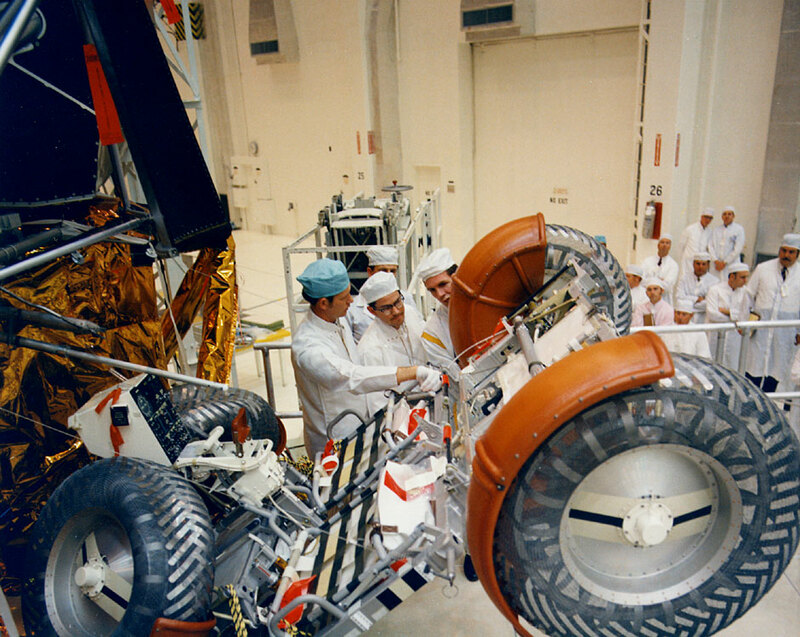 121:54:29 Irwin: Seems like when we get to the bottom...And I can see the trajectory of the fragments coming from the...It looks like...Yeah, they're coming from the front wheels and coming up kind of around my arm and then forward. 121:54:41 Irwin: No...No, it looks like millimeter-type particles. 121:54:44 Scott: Yeah. (Pause) Hang on. 121:54:51 Irwin: Okay, let's see, the distance 1.3. Okay, I think there's a large one coming up about 12:30 or 1 o'clock that could be Rhysling. 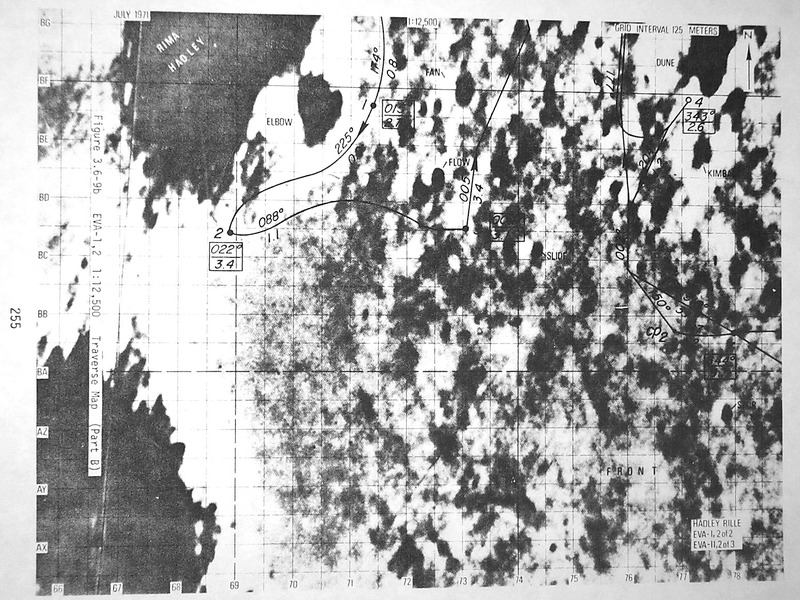 121:55:08 Allen: Jim, that sounds good or it could be the large one to the northwest of Rhysling (at about BL.7/71.5). Rhysling may be coming up on your left now. 121:55:23 Allen: Roger. But your heading is beautiful. Continue on. 121:55:44 Scott: (Laughing) Man, this is really a rocking-rolling ride, isn't it? 121:55:48 Irwin: Never been on a ride like this before. 121:56:08 Scott: Okay, here's a big one right here on our left, Jim. 121:56:09 Irwin: Yes, but I don't think it's big enough to be Rhysling. 121:56:16 Irwin: What did I say, Joe, about 1.6, 1.7, for Rhysling? 121:56:24 Allen: It's about 1.4, 1.5, Jim. 121:56:26 Irwin: Get on top of...(Stops to listen to Joe) That could be Rhysling, Dave; we'll find out when we get up on top of this ridge. 121:56:34 Scott: Yeah. (Pause) By the way, Houston, your comm is crystal clear for us up here. 121:56:46 Allen: So is yours, Dave. Maybe we ought to take this gear to Flagstaff next time. 121:56:54 Irwin: Off in the west now, I can see Bennett Ridge. 121:56:57 Scott: Oh, yeah. I've seen it all the way. You can see just the peak of it almost all the time. 121:57:06 Allen: And Rover, this is Houston. Your range to Rhysling is about 1.7; so you may be short of that still. 121:57:14 Scott: It just clicked off 1.7, and our relative bearing's 036. 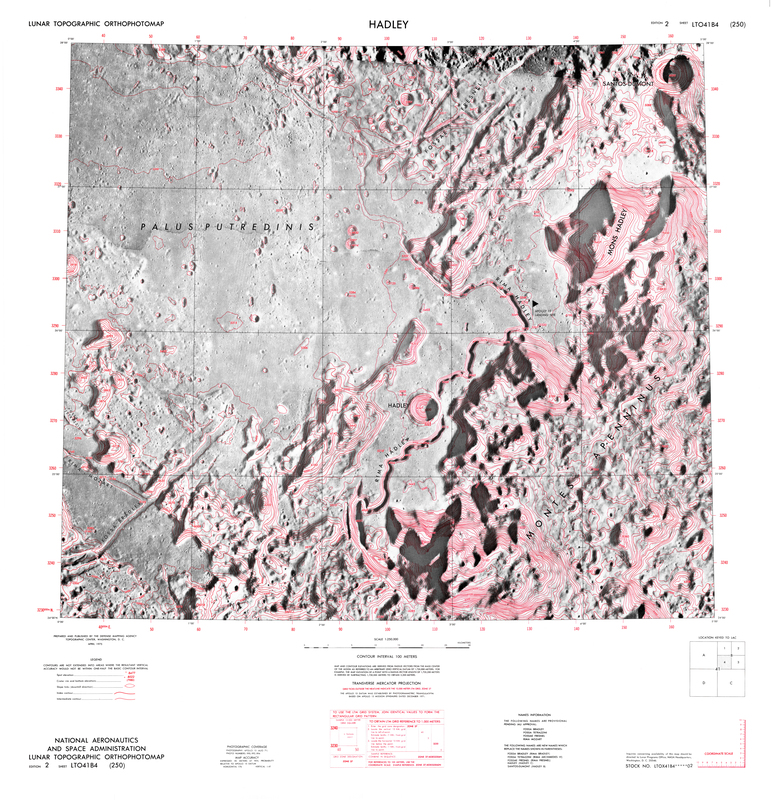 121:57:21 Irwin: Hey, you can see the rille! There's the rille. 121:57:22 Scott: There's the rille. 121:57:23 Irwin: Yeah. 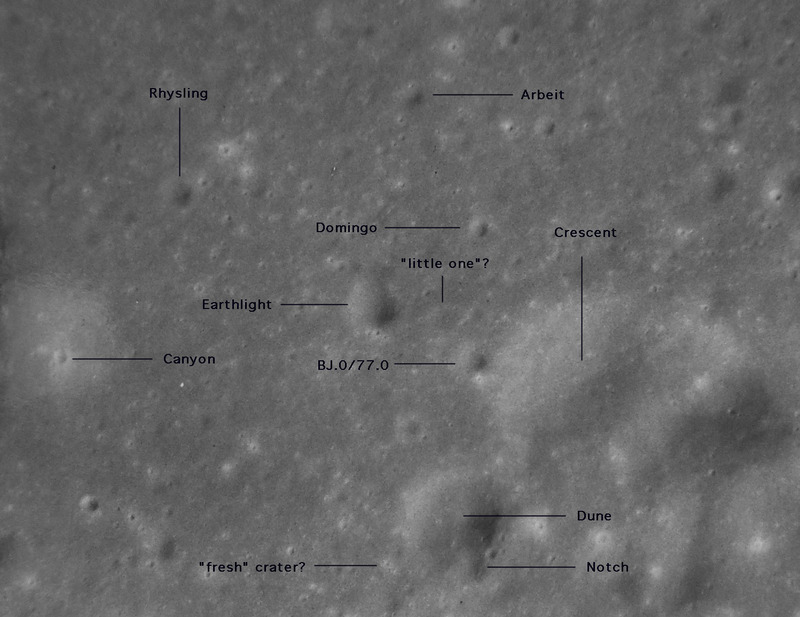 We're looking down and across the rille, we can see craters on the far side of the rille. 121:57:32 Allen: Roger. Like advertised. 121:57:33 Irwin: A lot of blocks. (Garbled) to turn the camera on. 121:57:40 Scott: Yeah. (Pause) Now we're getting into the blocky stuff, about 1 foot, quite angular, irregular surface. 121:57:55 Irwin: We're right at the edge of the rille, I bet you. 121:58:01 Irwin: I don't see Elbow though. Oh, yeah, I see Elbow. Dave, we have to stay up on the high part of the rille, here. 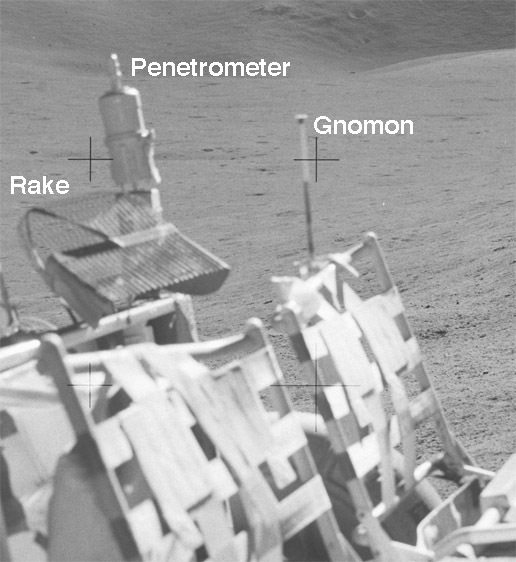 121:58:09 Irwin: See; Elbow is not as prominent as we thought, but there's a definite crater there. I see Elbow. 121:58:15 Scott: Yeah, it's subtle though; subdued. 121:58:17 Irwin: I'd better turn on the (16-mm)camera. 121:58:18 Scott: Hey, look there's a big block on the edge of the rille there that must be 10 meters (across). There are lots of outcrops. But, on the far side, I don't see anything that would suggest really layering. There's a lot of debris, big angular blocks all the way down, but nothing that you'd really call exact layers. 121:58:41 Allen: Roger. We copy. 121:58:43 Scott: Let me get us back up on the ridge, it's smoother. 121:58:47 Irwin: Yeah, I think that heading was...We were on a heading that was a little too far west. We're getting back up on the higher part of the rille rim. At this point, I'd estimate the slope is probably - what? - About 3 degrees? 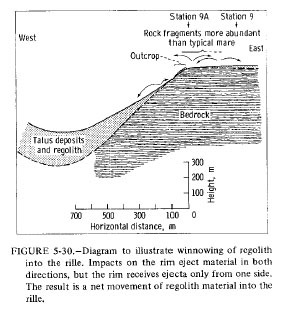 121:59:03 Scott: Yeah, there's a definite ridge or rim that runs along the rille, maybe 70 (or) 80 meters from the inflection point that drops down into the rille, don't you think, Jim? 121:59:15 Irwin: Yeah. (Pause) And, we might as well...We're heading right toward...We'll head toward the east side of Elbow. 121:59:37 Allen: Keep talking, keep talking. Beautiful description. 121:59:40 Scott: (To Jim) Hang on. 121:59:42 Irwin: I see one large block, about a quarter of the way up the Front, Dave. 121:59:48 Scott: Okay, hang on there. 122:00:10 Irwin: Looking up at the front now, Joe, I sure see the linear patterns that Dave commented on before. With the dip and everything. 122:00:19 Irwin: Boy, that was a good stroke. 122:00:21 Scott: It's a good stroke, all right. 122:00:24 Irwin: And, I sure get the impression it's a...Almost looks like a slump feature, but we'll take some good pictures of that. (Pause) You see the same linear-type pattern in the east side of the rille. And note the linear pattern there is parallel. Almost like layering in the rille. And, then as you look upslope - up the Front - that layering takes that dip to the northeast that Dave had mentioned earlier. 122:01:02 Allen: Roger, Jim. And can you actually see the east side of the rille, towards the south there? 122:01:09 Irwin: Oh, yeah. I can see...Looking directly south I can see the exposure that faces northwest. I can look down and I think I can see Hadley C down there! 122:01:43 Scott: Hang on; got one coming. 122:01:47 Scott: (Subvocal) Oh, my. 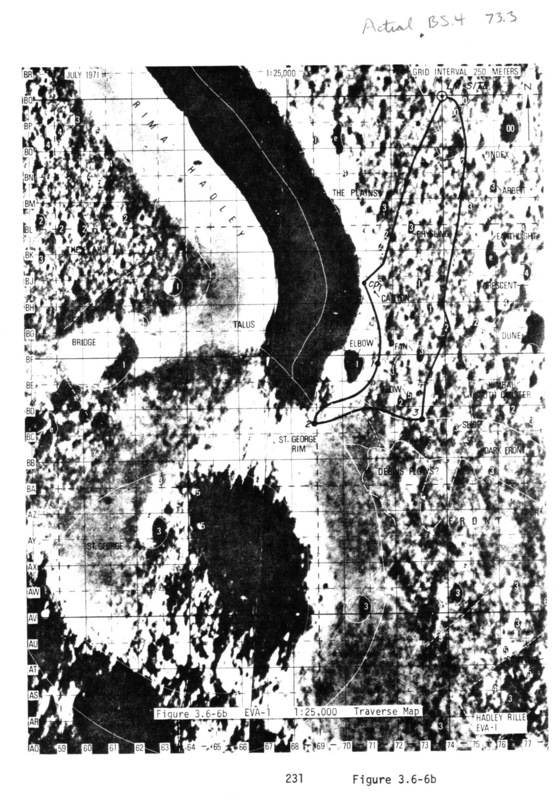 122:01:50 Irwin: It should be 2.7 (kilometers to Elbow Crater). So we got another .7 to go. 122:01:55 Scott: Okay, we're doing all right. 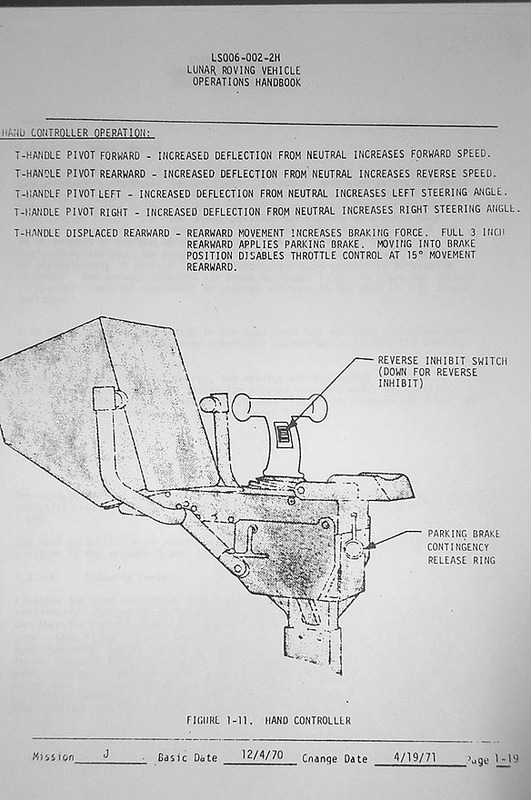 122:02:00 Irwin: Speed's been generally about 10 clicks (kilometers per hour). 122:02:11 Irwin: Yeah. And again, looking to the south along the edge of the rille that faces to the northwest, I can see several large blocks that have rolled downslope. Very large blocks that are about three-quarters of the way down the slope, into the rille. That's just at the base of St. George. 122:02:40 Irwin: And...Let's see, we're heading about 165 right now. Tried to stay on the fairly level and smooth part of the Rille rim. But looking over to the edge of the rille at this point, I see a large concentration of large boulders - large rocks. And I'd estimate the size...They're angular, and they're all of the same color and texture as far as I can tell from here. (To Dave) See that con(centration)? Well, you'd better watch the road, Dave. 122:03:22 Scott: Yeah. No, I see what you're saying there, but you keep talking; let me drive. 122:03:28 Irwin: Yeah. It's the first good concentration of large rocks that I've seen. Very similar (in size and angularity) to the large rocks that 14 saw up at the top of Cone. 122:03:42 Allen: Roger, Jim, we copy. And your range should be coming up on 3.1, at Station 1. 122:03:51 Scott: Okay, right now, Joe, our bearing is 18 and range is 2.3. 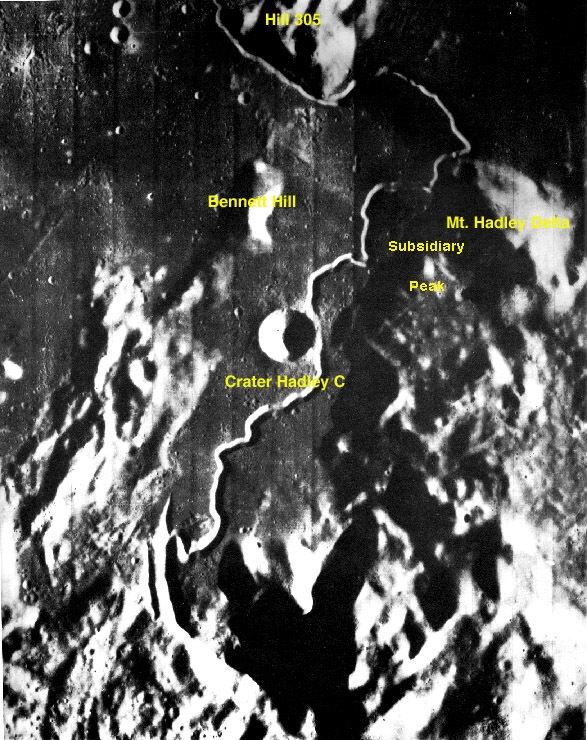 122:04:08 Irwin: Okay; now, Joe, I can see the bottom of the valley - Head Valley - that leads down toward Hadley C.
122:04:18 Irwin: I can see the bottom of the rille. It's very smooth. I see two very large boulders that are right on the surface, there (that is, they are unburied) - on the top of the very smooth portion, of the bottom of the rille. And the one to southeast, I can see the track (on the rille wall) of where it's rolled downslope. 122:04:53 Allen: Roger, Jim. Copy. And is the bottom V-shaped or fairly flat? 122:04:59 Irwin: I'd say it's flat. Well, it's hard to estimate. I'd estimate maybe, oh, 200 meters wide of a flat area in the bottom. 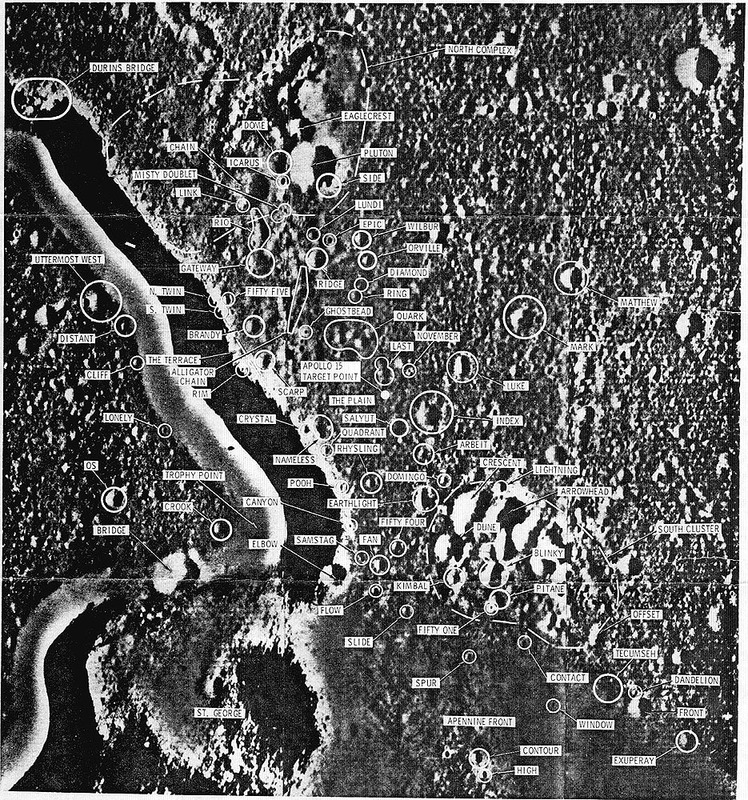 122:04:12 Irwin: Oh, and I can see what we thought was Bridge Crater. 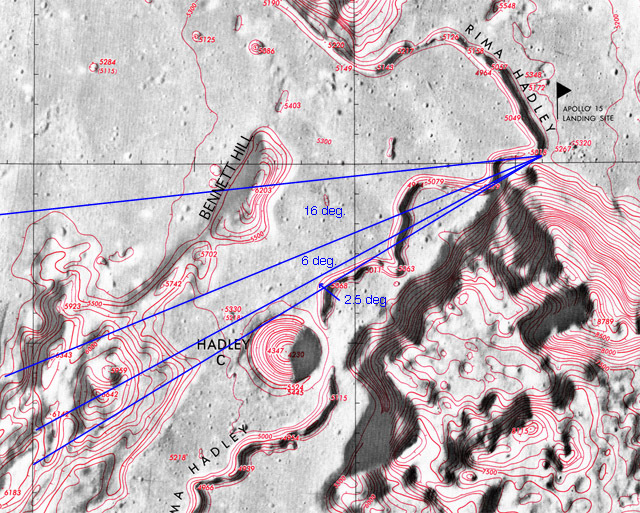 And it definitely would not have been a place to cross Hadley Rille. It's just a depression in the west wall of the rille. 122:05:47 Scott: Oop, hang on, Jim. 122:05:48 Irwin: Okay. (Picking up his comment again)...and the side of the rille to the northwest. 122:05:52 Allen: Roger, Jim. Copy all that, loud and clear. And Dave, are the front wheels wandering off of straight ahead as you drive along there? 122:06:04 Scott: No, they're okay, Joe. It's just (that) there are a lot of craters and it's just sporty driving; I've just got to keep my eye on the road every second. 122:06:13 Irwin: By golly, it's a real test for the Rover. 122:06:14 Allen: ...just want to get some engineering information here. Apparently, your front wheels are tracking straight ahead, is that correct? 122:06:23 Scott: That's correct. And, of course, when we turn, they dig in, and it makes the rear end break out (that is, start to swing around). But it's okay; we can handle it. 122:06:31 Allen: Knew you could. 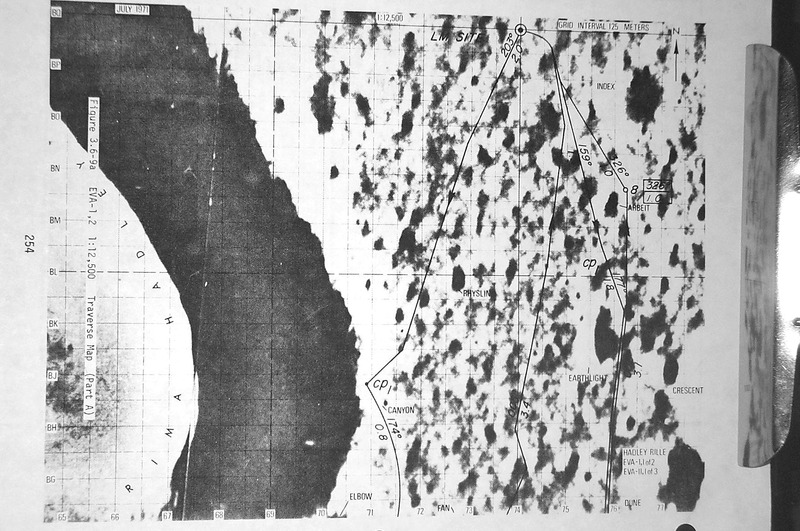 122:06:33 Scott: I might add to Jim's comment, that the near side of the rille wall is smooth without any outcrops, there by St. George, and the far side has got all sorts of debris. It almost looks like we could drive down in on this side, doesn't it? 122:06:48 Allen: Stand by on that, Dave. 122:07:00 Irwin: Oh, now I can turn around and look to the northwest - where the rille trends to the north. But I'll...let me concentrate on Elbow for the moment. 122:07:11 Scott: Yeah, let's get to Elbow. (Pause) (Jim laughs) Hang on. 122:07:26 Irwin: Okay, the range estimate must have been off for Elbow. 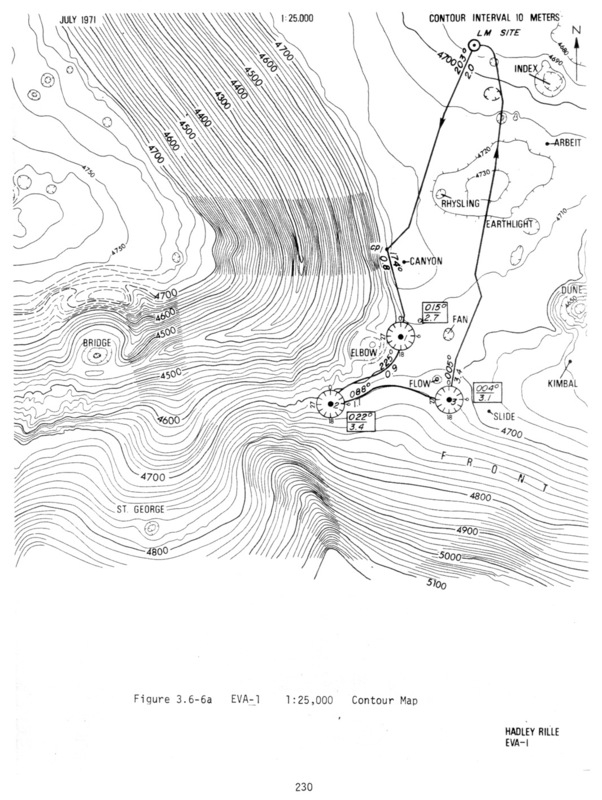 Our map says 2.7 (kilometer range from the planned landing site to the east rim of Elbow); Joe said 3.2, I guess. You confirm that, Joe? 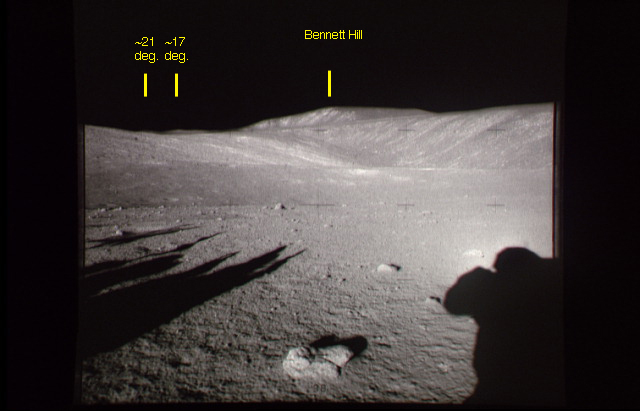 122:07:36 Allen: Our estimate, Jim, was 3.1 from your landing site (that is, from the presumed landing site near November Crater). 122:07:43 Irwin: I see, that's right. 122:07:44 Scott: That's the difference. 122:07:51 Scott: (Laughter) Well, this is really a sporty driving course. Man, oh, man, what a Grand Prix this is! (Pause) There's old Elbow. Isn't it? It's the real fresh one down here. 122:08:10 Irwin: No, Elbow's larger than that. 122:08:12 Scott: Yeah, but there's...Yeah, there's a nice fresh one there. 122:08:14 Irwin: Yeah, but you want to go a little farther east. See, that's Elbow out at 11:30. 122:08:19 Scott: Oh, yeah. Rog. Gosh, that's a long way away. 122:08:23 Scott: Distances are very deceiving! (It feels) like we've been driving for an hour. (Pause) Are you sure that's Elbow, Jim? 122:08:34 Irwin: Yeah. Yeah, you want to go farther east, Dave. 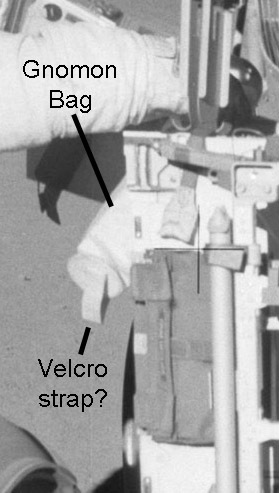 122:08:51 Irwin: See, that's Elbow out at our 1 o'clock position. 122:08:53 Scott: Shoot, this is Elbow right here, I believe, my friend. 122:08:56 Irwin: Yeah, this is Elbow right here. 122:08:58 Irwin: Yeah, this large one. 122:08:59 Scott: The one we were just trending into. 122:09:01 Scott: Yeah, that's some big fellow, isn't it? 122:09:08 Scott: Take a look up here (for a parking spot), and we'll see how she looks. 122:09:10 Irwin: Maybe you can, you know, angle up hill here? 122:09:12 Scott: Yeah. (Pause) How are we doing on time there, Houston? 122:09:18 Allen: Like gangbusters, Dave and Jim. Continue on, and we'll give you the exact number in a minute. 122:09:27 Scott: Okay. Do we want to stop at Elbow, or press on? 122:09:32 Allen: Stop! Follow the Checklist, just as planned. 122:09:37 Scott: Just as planned, okay. (Pause) Okay, let's go right up on the ridge line there, I see some debris. Maybe we can get a fresh one in the rim (that is, find a small, fresh crater which has punched into the Elbow ejecta). Be looking down-Sun (into Elbow with the TV). (Pause) Oh, look at this baby climb the hill. 122:10:00 Allen: Jim, can you get an Amp reading for us as you climb? 122:10:01 Irwin: Okay, Elbow's out there...(Answering Joe) Yeah, reading...Oh, it's just about. It's 10 on Batt 1, Joe. 122:10:21 Irwin: We got a good slope here about, I'd say 10 degrees; we're going up right now (to the Elbow rim). 122:10:29 Irwin: I felt it. 122:10:32 Scott: Did you feel that? 122:10:33 Irwin: Okay, now we're up on the high part, and we're on the east rim - east rim of Elbow. 122:11:06 Irwin: And, Joe, here's some readings for you. 122:11:11 Irwin: (Rover heading) 185, (bearing to the LM) 011, (distance traveled) 04.5 (km), (range from the LM) 03.2, (amp-hours remaining) 105, 112, (battery temperatures) 085, 087, and...Gee, I'm reading the lower limit on the Motor Temps, both Forward and Rear. Don't look like that gauge is operating. 122:11:45 Allen: Maybe they're still cool. 122:11:51 Scott: Let's hope so. Okay, Joe, I'll give you FM/TV here. 122:12:52 Allen: And, Dave and Jim. We gained 20 minutes back. We're making money hand over fist on your driving. 122:13:12 Scott: Never got that Velcro on the gnomon bag fixed.